Pretoria, South Africa – President Jacob Zuma and new police minister Fikile Mbalula have an immediate opportunity to radically improve policing in South Africa (SA) through the appointment of a competent, honest and experienced person to head the South African Police Service (SAPS) and the special investigation unit, the Hawks. This would solve the long-standing crisis in police management and the resulting deterioration in public safety over the past five years. A new campaign by the Institute for Security Studies (ISS) and Corruption Watch has called for a SAPS national commissioner to be appointed on merit following a transparent and competitive process, in line with recommendations in government’s National Development Plan. The selection criteria for SA’s top cop are today less rigorous than for the lowest rank of constable. This has led to people being appointed for political reasons rather than their ability to do one of the country’s most important jobs. The campaign proposes that candidates for SAPS national commissioner be chosen for their skills, experience and integrity. They should have to pass a security clearance and psychological evaluation prior to selection. The recruitment process proposed by Corruption Watch and the ISS would have prevented the appointment of past police commissioners who were dismissed for incompetence, dishonesty and corruption. The campaign calls for the public and the parliamentary portfolio committees of police and justice to have a greater role in appointing SA’s police leader. The campaign says the new process could be started quickly and five candidates could be shortlisted by end-2017. ‘This may be the most important change in SA policing strategy for many years,’ Newham said. 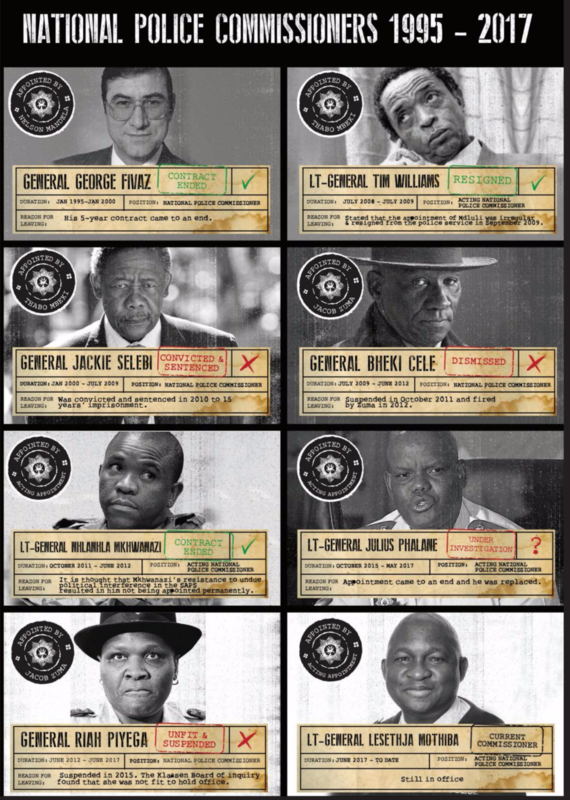 SA has had eight police commissioners since 1994. With the exception of George Fivaz, none of the permanent appointments to the post of SAPS national commissioner had policing experience – and each of these appointments ended in disgrace with a board of inquiry recommending that the SAPS head be fired. SAPS national commissioner is a powerful position but appointment of the wrong people has badly affected police performance, put the public at risk, and hindered social and economic development. The SAPS annual budget rose from R36bn in 2007 to R87bn in 2017, but detection of murder and robbery decreased. Visible policing also went down. Civil claims against police have risen 175% in five years to R290m. The murder rate has gone up 19.5% since 2011, and aggravated robbery is up 31.5%. ISS and Corruption Watch propose that the police minister establish a panel of skilled people to shortlist the most qualified candidates, with support from the Civilian Secretariat of Police and the parliamentary Portfolio Committee of Police. The panel’s first task will be to develop merit-based criteria for leading a professional police agency. An honest person with the right skills would have more support from colleagues and the public, the campaign says. And proper screening would make them less likely to be corrupt. The campaign proposes that candidates be interviewed publicly, before a shortlist of five is presented to the president to choose from. 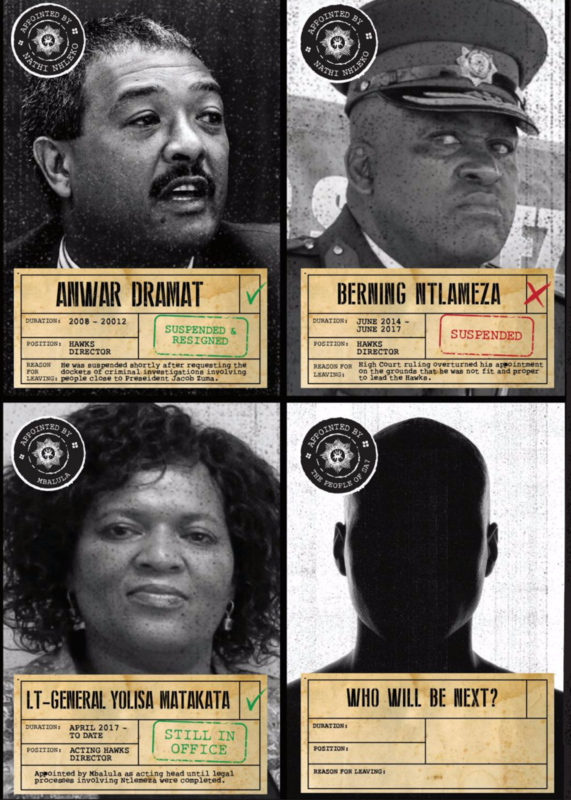 Current criteria for being SAPS national commissioner are simply that candidates are SA citizens by birth, over 18 years, and don’t have a criminal record. Constables face a higher bar. They need to be between 25 and 40, of sound character, and physically and mentally fit. They also have to have matric and to undertake screening and training. General George Fivaz succeeded in merging 11 police forces into a single national service. He served five years before stepping down. His successor Jackie Selebi, and ally of then president Thabo Mbeki, was convicted of corruption and imprisoned. Lt Gen Tim Williams took up an acting role and was instructed by former police minister Nathi Mthethwa to appoint Richard Mdluli to head the SAPS crime division. Mdluli is now being prosecuted for murder, assault, intimidation and corruption. The next permanent appointment was Gen Bheki Cele, who had no policing background but was an ally of President Jacob Zuma. He was fired in 2012 after the Public Protector reported on his involvement in unlawful property deals. 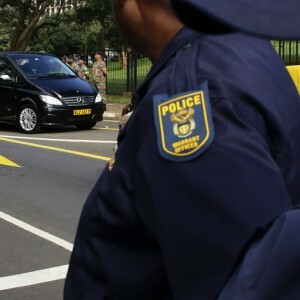 Lt-General Nhlanhla Mkhwanazi acted in the role for nine months before the permanent appointment of General Riah Phiyega, who lacked any police experience. She damaged morale and performance by replacing senior officers with people lacking experience or integrity. Damning findings were made against her for the police’s killing of 34 striking workers at Marikana. Zuma suspended Phiyega in 2015 but she drew a full salary and benefits until the end of her contract in 2017. Career policeman Lt-General Julius Phalane came next, serving as acting commissioner from October 2015 to May 2017. He is being investigated for corruption and was replaced in June 2017 by the current acting SAPS commissioner is Lt General Lesethja Mothiba.